Mile 3 of the marathon is all business. It’s time to take off the crappy old long sleeve t-shirt you were wearing to stay warm at the start and toss it to the side of the road. You are now flaunting a brand new technical-tee and a crisp race number, and that instantly makes you feel like a real runner. You’ve successfully navigated the first water stop and hopefully managed not to spill too much Gatorade on yourself. And most importantly, you’ve settled into your goal pace and your legs are starting to respond to the familiar rhythm. It’s time to get serious about running this race. I had my first chemo treatment on March 26. Treatment days start with a trip to the lab where they take blood to check your blood counts. Next, you meet with the oncologist. He goes over the results of aforementioned blood tests, talks to you about how you are feeling (both physically and mentally), and finishes up by outlining the game plan for the day. Then it’s off to the chemo ward to begin treatment. Just writing the words “Chemo Ward” kind of freaks me out. I’d heard from other people who have had chemotherapy that the “ward” is a big room filled with lounge chairs. It’s filled with cancer patients of all types, and people sit around comparing stories and treatment protocols. To be honest, the thought of sitting around all day looking at and talking to sick people really scared me. I know that sounds both ludicrous and mean considering (a) I am sick (b) you are supposed to be nice to sick people (my mother taught me well). But, frankly, I’ve put myself in the mindset that I am happy and healthy, and I didn’t want anything to shake that. I was afraid seeing lots of bald, feeble people might make me waiver from my headstrong mindset. So I was greatly relieved when the nurse said I would have a private room for the day. I guess since my treatment is longer than most (6+ hours) I get priority booking for the best accommodations. The “best” accommodations aren’t all that fancy – just a small room about the size of a walk-in closet, a shared bathroom, and my own TV/DVD player. But there’s no one in there except the nurse and my husband, which means no gazing at sickies for me! It’s pretty cheesy, but I ordered a yellow “Livestrong” Dri-fit shirt to wear to chemo. When I was in high-school and college, I remember how good it would feel to put on a clean jersey on race morning. It would make me feel tough and capable, and I wanted to replicate that feeling for my treatments. Since hospitals are notoriously chilly, and I’m always cold, I can’t get away with wearing just my short sleeved Livestrong shirt for treatments. So I pair it with my Boston Marathon jacket. Wearing the jacket reminds me that I was once a strong woman who qualified for and ran the most prestigious marathon in the world. And just like I was strong over Heartbreak Hill, I will be strong as they pump the cancer-fighting poison called “chemotherapy” through me. So my Livestrong shirt coupled with my Boston Marathon jacket has become sort of my “Chemo uniform”. Getting chemo was very similar to the inductions I had for my sons’ births. They hook you up to an IV, and you wait around for something to happen. It was actually better than an induction in that you could eat whatever you want instead of the ice chips and Valu-time popsicles that are the required staples of labor and delivery. Speaking of that, the biggest thing the nurses and doctors worry about when you have your very first chemo treatment is some sort of adverse allergic reaction. Not only can that impact the amount of life-saving medicine you can be given in the future, but the side effects can seriously mess you up. “Mess you up” meaning go directly to the emergency room without passing “Go” and collecting $200. During the morning, Vince stepped out on a Starbucks finding mission. He successfully completely his assignment and returned with two large drinks in hand. So we settled in to enjoy our beverages and catch up on some episodes of 24. Just as soon as I took a long swig and set my drink down, the nurse reappeared for one of her frequent blood pressure and temperature checks. My blood pressure was normal, but my temperature had skyrocketed over 2 degrees since her last visit 15 minutes ago. She started to look a little nervous – that sort of temperature change in such a short period could signal an allergic reaction or a quickly encroaching infection. She was about to call the head nurse when she happened to glance over to the spot on the floor next to my chair where I had set my cup just moments ago. She noticed my piping hot Starbucks and laughed. False alarm! The smooth, warm deliciousness of my chai tea latte had inadvertently triggered the temperature change. She noted in her log the caffeinated culprit and said she would time her next visit for after I had guzzled all my drink. At lunchtime, I sent Vince once again on a food and beverage finding mission. I really was craving a nice healthy wrap, but he couldn’t find one. Instead, he came back with a Subway Italian sub stuffed full with various meats and cheeses and slathered in mayo. Not as good for you as my initial choice, but oh so delicious! I hadn’t had one of these in probably three years so it was quite the treat and I devoured it up in record time. After lunch, we settled in again for more Jack Bauer. As I was watching Jack foil the terrorists for the umpteenth time, I started to have chest pains and feel nauseous. All day the nurses had drilled into my head that I needed to alert them immediately if I started to feel bad. So I paged my nurse, and she arrived in record time. She quizzed me on my symptoms and looked a little anxious as she transcribed everything into my charts. Perhaps haven learned her lesson earlier, she surveyed the room and spotted the remnants of my sodium and fat fueled feast. And she laughed again. “Instead of paging the doctor, how about I get you some Pepto-Bismal and see if that helps?” Magically it did. Instead of a serious chemotherapy complication, I was experiencing a run of the mill, everyday heartburn. So two separate potential red alarm situations were averted thanks to an eagle-eyed nurse. Next time I will be a little more thoughtful in my food and beverage choices on chemo day! Other than the regularly scheduled visits from the nurse, I was pretty much free to do whatever I want while I was receiving chemo. However, since I was tethered to the IV pole and I’m still on crutches, I couldn’t exactly go roaming the halls of the hospital or anything. So I settled into the room’s very comfortable Laz-Z-Boy recliner and just chilled out. Vince and I spent most of the day talking, reading, watching tv and surfing the net. Other than the whole cancer part, it was like a mommy’s dream come true. Relaxing all day long, thumbing through girly magazines and watching frivolous tv shows, with no temper-tantrums, diapers to change or floors to sweep in sight – sign me up! At the hospital, they give you a super dose of anti-nausea medicine via your IV to prevent you from vomiting your brains out during treatment. So I kept down my Starbucks and Subway binges without issue. Since the super dose will eventually wear out, they send you home with a big bottle of anti-nausea pills. Interestingly enough the anti-nausea medicine they give for chemo is the exact same stuff they give for morning sickness during pregnancy. As I mentioned before, I escaped the daily barf fest during both my pregnancies but many of my girlfriends did not get off so easy. We would commiserate as pregnant ladies do and they would oscillate between acclaiming the virtues of Zofran and hating me for having a puke free pregnancy. When I got home, I felt a little queasy for the first time, so I popped some pills and took a brief siesta on the couch. That combination nipped it in the bud pretty quickly, and I even was able to rally and hit my neighborhood book club later. Like pretty much all our meetings, the evening involved lots of margaritas, limitless gossip and a little bit of book discussion thrown in for good measure. I didn’t stay late (and only sipped one drink), but it was nice to get out and do something normal after such a long, strange day. The next day was a little tougher. The best way to describe it is “hung-over”. Not a half dozen shots of Tequila at a dive bar hung-over, more like 3 or 4 glasses of wine with girlfriends hung-over. My head was foggy, and my stomach felt a little off, and I had a compelling need to eat greasy foods and watch dumb shows on tv. The second day I felt much better. I was a tired but much more functional – my head was clear and my stomach was almost back to normal. I probably pushed it a little too much that day as I crashed hard that night. But all in all, it could have been much worse. I returned to work four days later, on Monday and had a sales meeting on the other end of town first thing in the morning. Sales meetings are always tiring because you have to wear a suit and heels and act perky and interested even when the client is asking the most mind numbing basic questions. While I was sitting there trying to be attentive, all I could think about was “I have cancer. My body is full of chemo toxins. And these guys have absolutely no clue”. It was very surreal, trying to act like it was just another day at work when it was anything but. It was my first day as both as a career woman and cancer patient. So that summarizes my first chemo treatment and the following week. I will write another installment soon detailing the “recovery” weeks between treatments, hair loss, and other burning topics. Connections with friends and family near and far – People have been asking how things were going, and this has proven to be an effective and efficient way to reach people. Therapy – As I write this, first in my head and then later on the computer, it’s really helped me understand my thoughts and feelings. I’m not a support group kind of gal, so this has been very helpful to me. History – My sons are too little to understand all of this now. However, some day I hope to share it with them so they can understand their mommy has another side than PB&J maker and time out giver. One unexpected outcome of sharing my story is that I’ve heard from others who have also experienced major challenges in their life. In many of the cases, I’m sure it was very painful for them to relive their experiences, and I am so thankful they were so gracious to reach out to me. Their challenges range from raising twins (which still scares the hell out of me!) to having major heart surgery at a young age to dealing with the loss of a spouse or sibling. All of these stories came from ordinary people who never thought they would have these obstacles in their life. But when presented with the challenge, they dug in, and they overcame. It truly inspires me and gives me courage. I’ve always felt that you never knew what you were capable of until you are presented with a challenge. 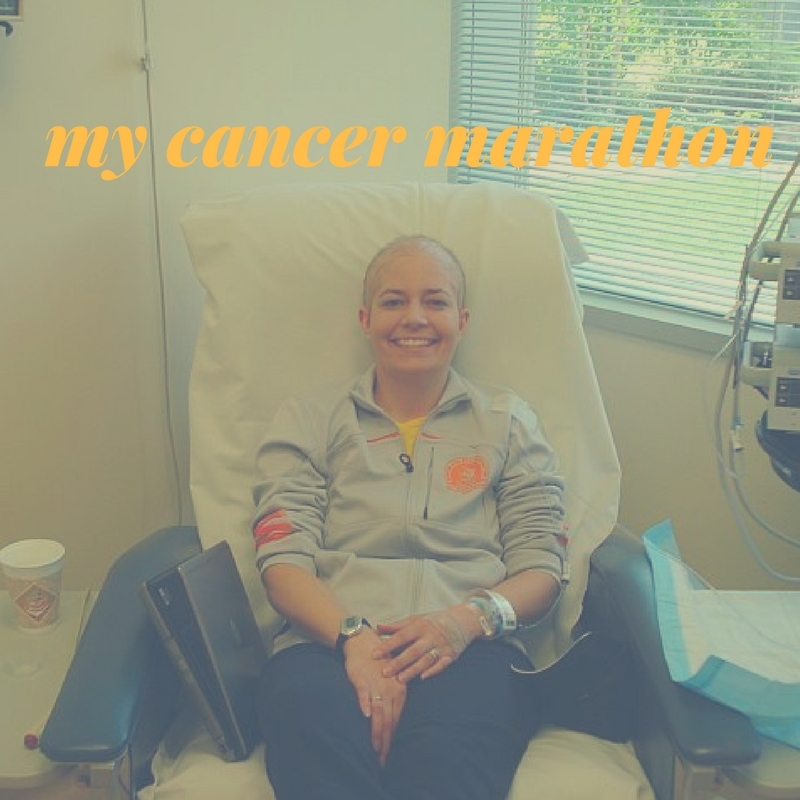 I still believe that and now see that challenges come in two forms – those you choose (like running a marathon) and those that choose you (like having cancer). No matter the origin of your challenge, you ultimately become a stronger person by taking it on. What challenge will you take on today?